Understanding the urban development of the industrial city means to have in mind a specific narrative that evokes and captures the multifaceted metropolitan scenario. The depiction of the city in the guidebooks is the finest encounter between words and spaces; it’s an essential witness for the analysis of the different social, economic and cultural factors that give meaning and relevance to urban shape -especially for understanding the relationship between these processes and the transformations of the territory over time.The spread of guidebooks in the mid-nineteenth century is a symptom of visual and narrative excitement focused in the metropolis as an object of large-scale exhibition. Specifically in Barcelona, the commercial possibilities of this narrative increased since the second half of the century and developed itself at the same time as the definition of a specific imaginary for the modern city was taking shape. This background determines the boundaries of this study (1839-1912), which follows the path of a series of city guides and its fitting in the essential period of modernization of Barcelona. The way these works are closely related to the emergence of the new metropolitan scenery raises them to the grade of city's founding narrative. Rodriguez, C. Barcelona : instrucciones de uso (1839-1912) : el imaginario de la ciudad moderna en las guías turísticas. A: TERRITORIS DEL TURISME L’IMAGINARI TURÍSTIC I LA CONSTRUCCIÓ DEL PAISATGE CONTEMPORANI. 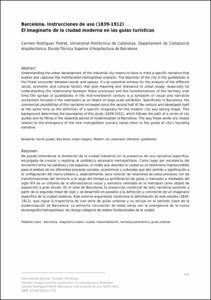 "TERRITORIOS DEL TURISMO: EL IMAGINARIO TURÍSTICO Y LA CONSTRUCCIÓN DEL PAISAJE CONTEMPORÁNEO". Girona: 2014, p. 631-643.